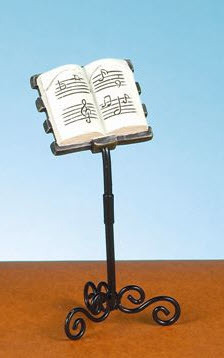 Whether you use these music stand place card holders or you simply give them out as music themed party favors to hold a favorite photo, we know that your guests will enjoy them in the years to come. Made of durable resin and hand painted, they measure 3 1/2" Tall 1 3/4" Wide. There is coiled wire in the back of the "music" which holds your place cards or photos.